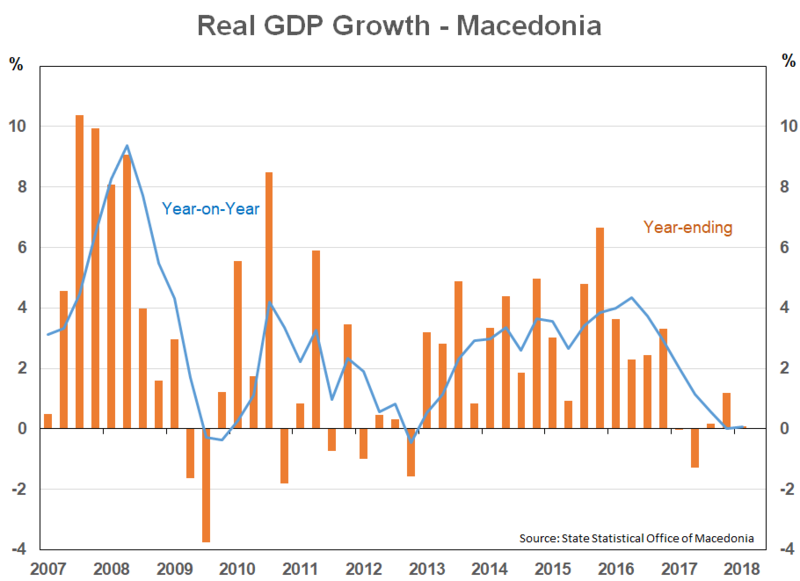 Macedonia’s economy was flat (0.09 per cent year-ending) in Q1 2018. Jobs increased, unemployment fell, but an ongoing decline in the construction industry and domestic investment has kept the economy flat. (graph 1). Certain parts of the economy continued to grow strongly in Q1 including Wholesale and retail trade (10.5 per cent YE), Manufacturing (5.5 per cent), and Agriculture (6.6 per cent). However, this was largely offset by the ongoing decrease in Construction (‑37 per cent) and a decrease in Information and Communications (-6.9 per cent). The decrease in Construction contributed a -4.5 per cent to the 0.09 per cent increase in GDP for the quarter. 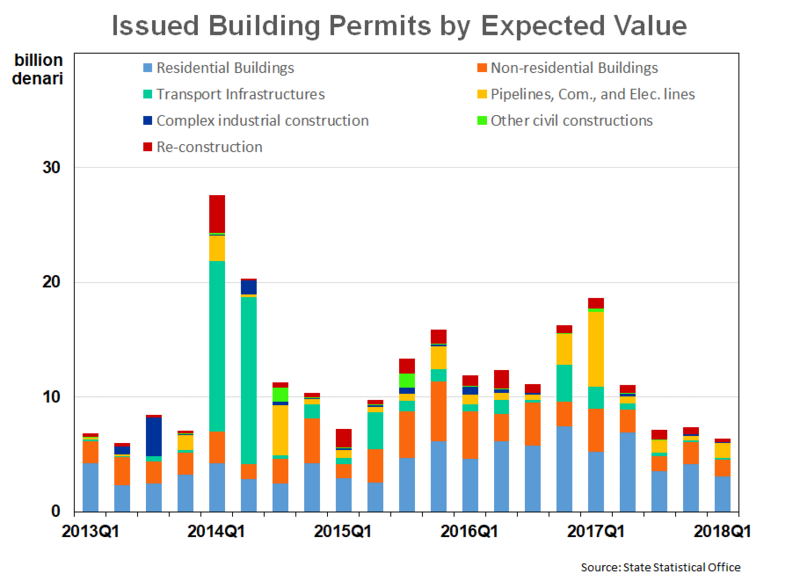 While the decrease in construction since late 2017, is most pronounced in civil engineering construction, residential and non-residential building have also decreased (graph 2). In expenditure terms, exports led the way with a 10.6 per cent increase (YE) while Gross capital formation (-9 per cent) and General government final consumption (-1.4 per cent) both decreased again this quarter. Total inward direct investment increased in the quarter (113 YE), however, direct investment by direct investors fell (-41 per cent). 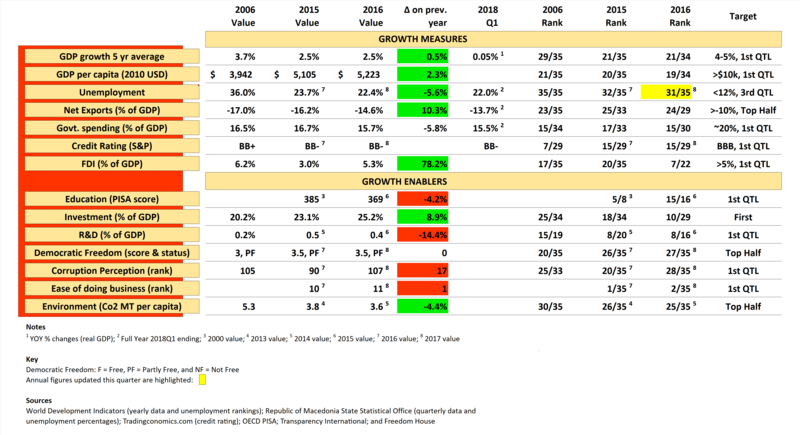 Direct investment by direct investors represents additional money from overseas being invested in Macedonia (either in new or existing projects). Unemployment again improved slightly in the quarter and now stands at 21.6 per cent. 4,686 jobs were created (net). Macedonia’s ranking for unemployment improved by one place to 31st among its Country Dashboard peer countries (table 1).